County Councils in theory are run by the elected members, the Councillors. However, this body of Councillors are often easily persuaded. In the last 9 years I've been a member of this Council the strategy is usually "There is a terrible problem" with whatever, for which there is only one solution "We need to give public money to elaborate and expensive project X"
This is usually not only the Council's money but free grants of public land, support for other grant aid or favourable loans, sympathetic planing permission, infrastructure added for free at the Council's expense and a promise of a massive boost in jobs/services/low cost housing which never quite materialises. The Scarlets' board had made friends with influential locals and not only within the Council. Llanelli AM Helen Mary Jones was, she said. won over by a display of desperation and weeping in her office by Huw Evans [Club Chair owed £millions by the club in outstanding loans] and chief executive Stuart Gallagher. Overwhelmed by their plight she instructed Neil Baker,the Plaid Group Leader on the County Council to use the Whip to fully back the project,The Plaid members voted unanimously for the deal - the only political group to do so. The was despite the efforts of the local Llanelli.Plaid Cymru members who did not support the massive "investment" into a club who could play rugby with distinction but whose financial management was far from championship level. In the manner of timeshare salesmen, Council Chief Executive Mark James and Finance Director Roger Jones and others arranged a series of meetings selling the wonderful shiny new stadium to the elected councillors. The new stadium was going to bring millions to the area, save Rugby as a sport, put Llanelli on the map and make the councillors members of the bestest ever council in Wales. If they didn't back the scheme Llanelli, the Scarlets and the whole local economy would die. The local community in the area was about to lose not only the benefits of a stadium local businesses depended on, their close association with the club and public access to green open space. They would gain 450 houses and would get nothing from the deal. The section 106 funds would go to the new stadium miles away as a community asset for all Llanelli, They could not understand why the stadium could not be upgraded on site. The area was already prone to floods, traffic problems were already serious and would be unsuitable normally for housing development. The out of town stadium was no solution to local needs but this project was driven by money alone, and the likely major beneficiaries were not members of the local community. The move away was mainly motivated by the need to make money for Mr Evans and others who wanted the money they had invested in the Scarlets to return to their own pockets,In order to spread the wealth smaller parcels of land around the site were bought up by mysterious investors in the expectation of sharing in the bonanza. 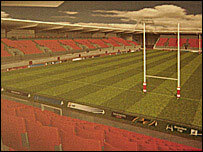 The 106 deal had already privately been agreed in correspondence with the County chief executive and the fact that the Scarlets had no money to put into the Stadium until the site was developed was overcome by the offer of a £5.56 million loan from the County on interest only terms, so that they were "making their own contribution" to the build in theory but in practice had not put in a penny. More money slipped away. A further £2,6 milliom was loaned, A similar amount was gifted as a grant.The club blamed the local residents who had asked for the public access practice pitches to be retained as a village green [refused] and had insisted on the preservation of a public right of way through the site [achieved]. evidence that they were not unrelated to the Scarlets. It looks like the Scarlets' Chairman may have speculated in the hope of extra little profit on the side. Two parcels of land were bought by a company in which he had an interest. The development land of the Stradey Park site as a whole was said to be worth £22m in 2008 but a Barclays loan was needed to support the club's cash flow and the degree of capitalisation of the site is unknown. Councillors in Carmarthenshire have agreed to lend the Scarlets £2.6m to help pay for a new £23.1m stadium. The rugby club said delays and the cost of fighting two public inquiries had left it with a £5m shortfall. Council leader Meryl Gravell assured members the loan would have no impact on services or council tax. Other problems soon arose when the Directors of the Club, who promised in the funding meeting to cover any further losses,did not do so. The cost of building the Stadium was eventually £27m, the free ground lease to the club for 150yrs is valued at £5m. Ground preparation cost around £5m as the whole site- a boggy old rubbish dump with underlying mine shafts required heroic quantities of concrete to be pumped into it. In Llanelli the project was not popular, the bad feeling was not against the club specifically but against the Club Executives who appeared to be the only beneficiaries of all this public money and the County Councillors who had supported the financial deal. Such was the feeling against the Indy/Labour Coalition that had promoted the new stadium deal that Plaid returned its best ever Council election results in Llanelli in 2008. Both Labour County Councillors for the Stradey area Eryl Morgan and Keith Price Davies, lost their seats to Plaid. Neither supported the move and Eryl actually had the guts to vote against the financial package in Council while Keith went out for lunch and "forgot" to come back to vote. Here is a contribution to the Scrum V rugby forum on the subject, informed by land registry documents. nd are owned by a property company wholly owned by Scarlets chairman Huw Evans, and another section is owned by a company whose ultimate ownership is disguised by company registrations in the Isle of Man and the British Virgin Islands. One Land Registry document shows part of the land covered by the club's planning application was bought by Stirling Property Management Ltd for £90,000 in October 2000. Another piece of land was bought by the company for £135,000 in May 2002. All 100 shares in Stirling Property Management Ltd, whose registered office is in Cheltenham, are, according to the current information held by Companies House, owned by Mr Evans, 57, who lives in Cheltenham. The other company,Tollington, is registered in the Isle of Man, whose companies registrar holds a document showing that the firm has two shareholders - Scarlett Investment Holdings Ltd and Scarlett Nominees Ltd - both registered in the British Virgin Islands, a well-known tax haven. Registering companies in the British Virgin Islands enables those involved to keep their identities secret." Barclays may have required some of the site capital as collateral. It is not clear yet how much of the the expected profit the club will eventually realise. However, the local County Council had not forgotten their "investment" and would continue to donate generously to the project, both in money and planning permission. the inner circle ( the James elite ) where they belong in jail. They don't launder as much in Sicily or Las Vegas.